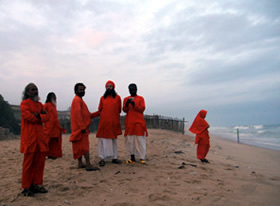 This year Dada Pramananda facilitated the coordinating of Neohumanist educational activities in West Africa. 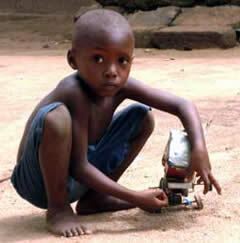 The first NHE Summit was held in March 2009 in Ghana and a board was formed to oversee the educational activities. The second programme this year was the Neohumanist Education Seminar held in Ghana in August which then joined the Ananda Marga yearly conference held in Lome, Togo including participants from the Ivory Coast. 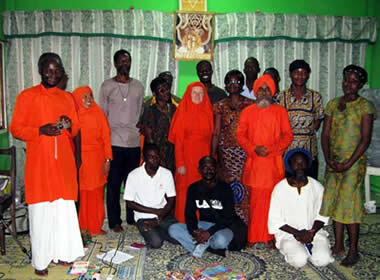 The Neohumanist Education Seminar was held at Madhu Shyam in the outskirts of Accra. Madhu Shyam is a spacious building surrounded by lush green garden with mango trees, coconut trees, neem trees, bananas and papayas. Tarinii was the cook for the programme and served delicious Ghanaian dishes. The programme started with a slideshow on the Liberation of Intellect: Neohumanism in order to recall the leading ideas of Neohumanist Education. This was followed by a slideshow introducing the basic foundational philosophy and principles of NHE. In the first workshop individual participants or small groups had to come up with an action plan for their particular area of work applying the philosophy of Neohumanist Education. They used the template we had worked on at the NHE conference in Australia and in Copenhagen: WHY – WHO –WHAT – HOW – WHERE. In the evening we had presentations on schools around the world and school and classroom design which was inspiring to the budding new schools that are coming up in Ghana and Togo. Finally there was a slide presentation on P.R. Sarkar’s writing of “Humanity is One and Indivisible” telling of the origins of the planet, the creatures and various species and how the early human beings emerged. This was a very fascinating visual learning and understanding of the Oneness of humanity. 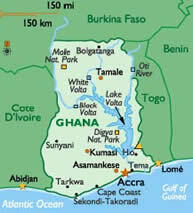 On Sunday the seminar continued on new premises at the Ananda Marga Center in Accra located very close to the beach. There was Dharma Cakra, the weekly congregation of collective meditation and lively spiritual singing in the morning. The drumming and singing goes on for a good hour when everyone becomes alive in a very natural innate cultural expression. After that is the collective meditation. The seminar continued with presentations of practical ideas that could be implemented in the classrooms and designing posters for the classrooms with the help of children. Yoga for children of all ages was a practical workshop which everyone enjoyed. The final workshop was on Multiple Intelligence methods where different groups presented “What did I learn in this NHE seminar” using Multiple Intelligence methods to demonstrate their learning. This was fun to do, to present and for all to watch. Teaching nutrition and vegetarian cooking by Tarinii at her Vocational Institute where she is studying. This kindergarten is on the premises of the Lotus Children’s Centre in Soko, a part of Accra, Ghana run by Didi Ananda Shanta. 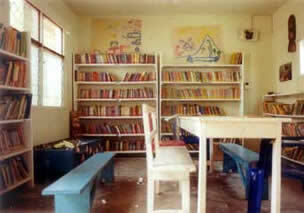 The kindergarten has a pleasant room, playground, a very well stocked library and about 30 children benefit from a good education. The Lotus Centre has 15 children living there, some attending college, others keeping a well-regulated, neat and homey living environment. Regular international volunteers are helping in the activities of the school and children’s home as well as at the two rural clinics. 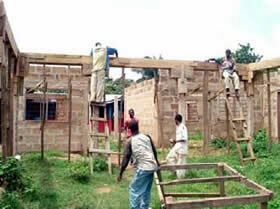 There is land in the outskirts of town for a primary school for which funds are needed for the construction. 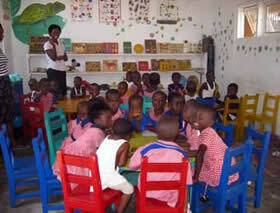 This is a kindergarten attached to the Ananda Marga main centre in Accra run by Pamkaj. There is playground, painted wall decorations in the playground and 50 children benefit. There is scope for further development. 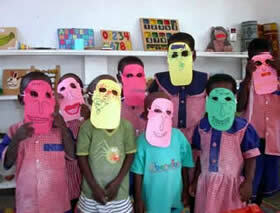 Cosmic Academy is a kindergarten and primary school run by Sister Jayaliila on the spacious outskirts of Accra. The school is on a fairly big area with boundary walls, playground and is presently expanding to add more classrooms. 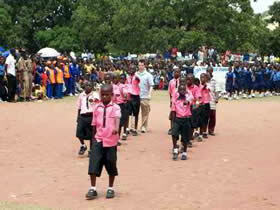 The classes are from Kindergarten up to grade 6 with 75 children. The school is under construction at a good location. The land was donated by Yogeshvar. The construction is supervised by Dada Pramananda. This school is from kindergarten to grade 6 run by Didi Ananda Liilamaya and has 300 children in the city with rather limited space but with good facility and good quality education. It is located on three acres of land in the heart of the capital city Lome in Togo. The school in modest beginnings running up to grade 6 but needing urgent funds for expansion, compound walls, electricity and other general infrastructure. The scope for development is great. On this spacious land graciously donated by the city there is the chance to develop a model NHE project with KG, primary and high school and teacher’s training in the midst of green flower and vegetable gardens. Dada Tanmaya is running the project with the help of the local guardians. The school started as Kindergarten in 2001 serving the nearby children and in 2007 the primary school was added in a simple concrete building. 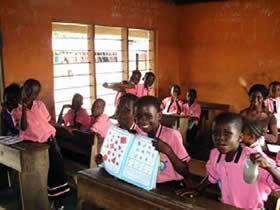 As of now there are 220 children enrolled from Kindergarten to Primary grade. There are eight teachers for Kindergarten and six for Primary. 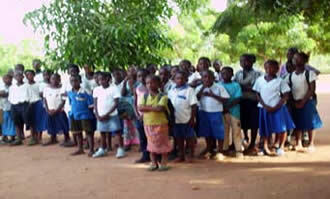 The school is serving the needy children from the area who are not able to pay any tuition. 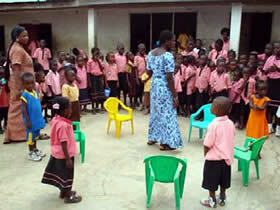 The school in a small town in the countryside of Ghana is run by Dada Shiveshvarananda. This school is from kindergarten to junior high school with 417 children, 17 teachers and a store attached to the school for income generation. 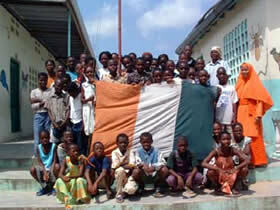 International volunteers are regularly helping and supporting. 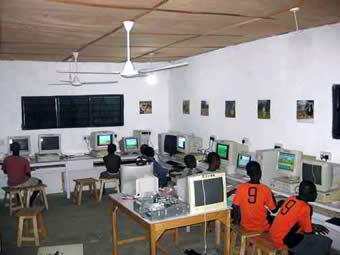 This year they have added a computer laboratory.